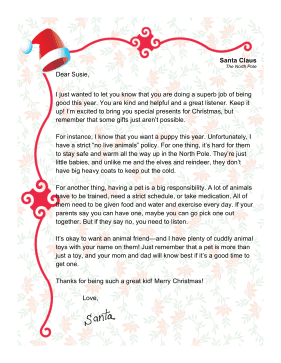 Curb a child's request for a pet with this cautionary letter from Santa. I just wanted to let you know that you are doing a superb job of being good this year. 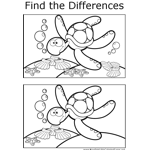 You are kind and helpful and a great listener. Keep it up! I'm excited to bring you special presents for Christmas, but remember that some gifts just aren't possible. For instance, I know that you want a puppy this year. Unfortunately, I have a strict "no live animals" policy. For one thing, it's hard for them to stay safe and warm all the way up in the North Pole. They're just little babies, and unlike me and the elves and reindeer, they don't have big heavy coats to keep out the cold. For another thing, having a pet is a big responsibility. A lot of animals have to be trained, need a strict schedule, or take medication. All of them need to be given food and water and exercise every day. If your parents say you can have one, maybe you can go pick one out together. But if they say no, you need to listen. It's okay to want an animal friend-and I have plenty of cuddly animal toys with your name on them! Just remember that a pet is more than just a toy, and your mom and dad will know best if it's a good time to get one. Thanks for being such a great kid! Merry Christmas!